I'm always a fan of things I can make ahead. This post also serves as a movement to end purchasing bottled goop that pass as pesto on the shelves of grocery stores. There are a lot of preservatives in them and the taste is just wrong. 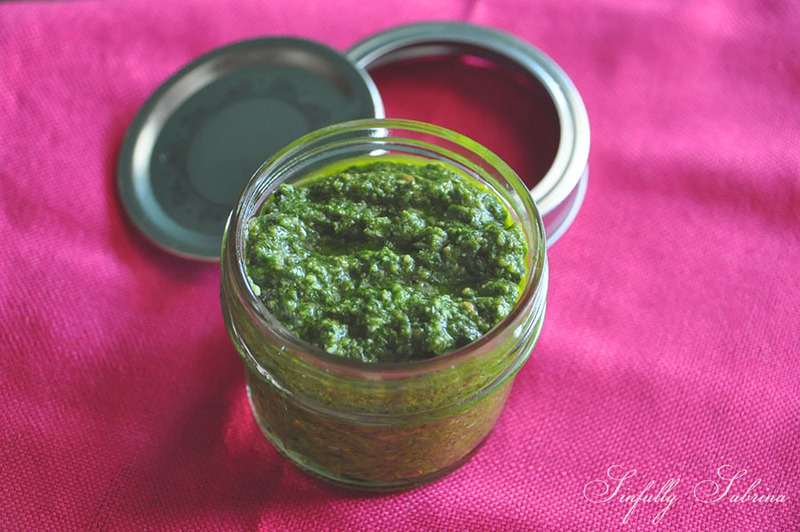 Pesto is super easy to make, all you need is a blender and 10 minutes of your time. When bottled properly, it lasts about a week in the refrigerator. Stir fry some garlic, zucchini and cherry tomatoes in olive oil, add the pesto at the last minute when all the vegetables are cooked through. Mix the pesto with cream cheese and some heavy cream and you have an instant dip! Now all you need are chips/crackers! So I hope I've convinced you enough to take only 10 minutes of your week. If you do, nutty and woodsy vegetable/pasta/meat dish(es) are within arm's reach for 7 days! Enjoy! Notice that adorable 4 oz. ball jar, that's from Paper Straw Love. Place the garlic and nuts on the blender and pulse until nuts are finely chopped. Combine the rest of the ingredients in the blender and pulse until everything has come together. Add more olive oil if mixture is too dry.